Put all the ingredients in a small saucepan and bring to a boil over high heat. Stir mixture until all the sugar is dissolved. Remove from heat and let steep for 30 minutes. Strain the syrup through a fine mesh strainer and discard the solids. Brew the tea in the hot water for 5 minutes. If using loose leaf tea, strain the tea into a mug. If using tea bags, remove the tea bags and discard. Stir in the steamed milk holding back the frothy top with a spoon. Top tea with the reserved foam. Grate some fresh cinnamon on top, if desired. 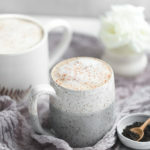 To froth the milk, you can use the steam wand on a cappuccino machine if you have one. I use the whisk attachment on my immersion blender by first warming up the milk in the microwave until it just begins to steam. Then I pour the milk the into a tall 4-cup plastic container (you want something tall so the milk doesn’t splash out) and whisk for 15-20 seconds until the milk is frothy.